What do women want in the workplace? The Independent Women’s Forum conducted a study of 1,000 women in an opt-in, online panel, comprised of mothers and non-mothers, liberal and conservatives, to reveal the biggest factors that contribute to female contentment at work. The report discovered that liberal women prefer having female supervisors, and they favor annual salary and family medical leave above all other considerations. IWF was surprised by some of the findings. The first of these is interesting because it is counterintuitive: since the ideology of liberals does not favor material wealth, it does not make sense that liberals value more annual salary, and by so much! The second of these is much more intuitive, especially in the context of this study: the ideology of liberals favors protecting workers from employers by law, and the current liberal-backed HFA will in fact augment family medical leave, doing just that—so it makes sense that liberals value more family medical leave as a category. 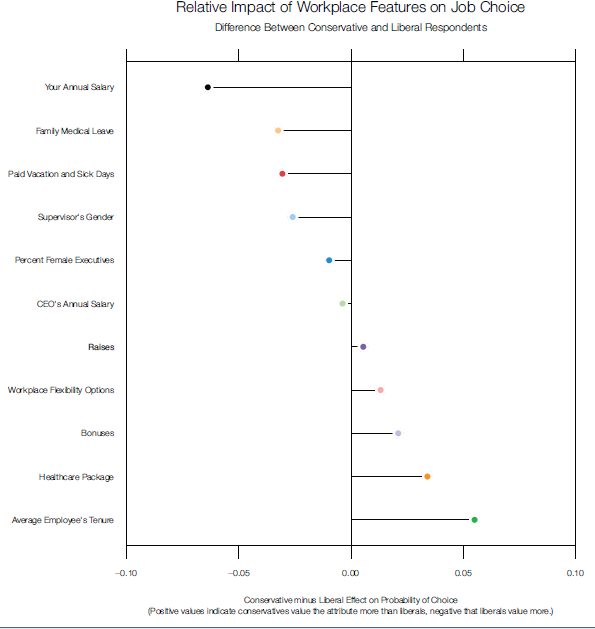 The conservative considerations, tenure and health care, made a bit more sense. Since the ideology of conservatives favors continuity and tradition—even loyalty to one thing at the expense of diversity—it makes sense that conservatives value more average employee’s tenure. Also, interpreting the advent of Obamacare as an event counter to the ideology of conservatives and making the issue of healthcare more salient to them than liberals in the aftermath, it makes sense that conservatives value more healthcare package as a category. As for general preferences, all women prefer, in addition to a promising salary of course, the presence of a bonus and raise system that above all values individual performance. IWF also studied how motherhood enters into the equation. Working mothers overwhelmingly value workplace flexibility and paid vacation and sick days over raises and salary. Since non-mothers have fewer time constraints with no children to take care of, it makes sense they prefer spending more time at the office and earning more money. General job flexibility is highly valued by women; offering a combination of flexible schedules, telecommuting, and reduced hours is about equivalent to offering 10 paid vacation and sick days or between $5,000 to $10,000 in extra salary. Signals of company character — such as CEO pay, bonuses and raises, and the percentage of female executives — have a large collective impact. Perceptions of workplace "fairness" aligned closely with a woman's job preferences. With conditions like these, 9 to 5 doesn’t sound so bad to working women.